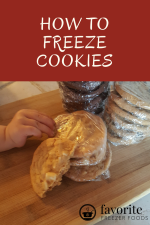 Learning what you can freeze and can't freeze is one of the hardest lessons for beginning freezer cooks. There’s nothing more disappointing than spending your time and money to make a big batch of something for the freezer just to throw it away when it turns out bad. But certain items simply can't freeze and are bound to give you bad results. Learn what you can freeze and can't and you're on your way to saving tons of time and money in the kitchen while getting healthy homemade meals on the table. That's what freezer cooking is about. When we freeze food the moisture in the cells expands. In foods with lots of moisture and delicate structures, like a fresh crisp spinach leaf or strawberry, the cells burst when the moisture expands and they are kinda limp when defrosted. Meat, poultry and fish all can be frozen with success. Raw meat is preferable for long storage because it doesn't dry out or get freezer burn as fast as cooked meat. Breads and baked goods can freeze and do well in the freezer. This includes cakes, pies, muffins, bagels, quick and yeast breads both as dough/batter or baked, cookies raw or baked and pizza crusts raw or baked. Butter and margarine freeze great. Beans freeze well and can save you a ton of money if you buy dry beans then soak and cook them yourself instead of buying the canned variety. Rice can also freeze and cooking it ahead can save a ton of time. Most foods fall into this category. Fruits and vegetables all soften and those with high water content do not freeze well. 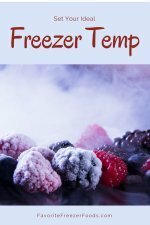 Fruit that still has ice crystals can be eaten as is after thawing but most fruits and veggies should be used for cooking after being frozen. Fruits and veggies do need some prep work as well. Potatoes freeze great and make quick side dishes, however they must be cooked before freezing to insure they don't turn black. Pastas will become much soften after they are frozen and should only be cooked about three quarters of the recommended time. Also pastas frozen in liquid or sauce will absorb much of the sauce. Milk and dairy products can be frozen but may separate after being frozen. Cheese will become crumbly and hard to slice but is fine for cooking or melting. Herbs lose their texture but retain their flavor. Frozen herbs can be used for cooked dishes but not for garnishes. Raw eggs removed from their shells can be frozen but are mixed with a bit of salt or sugar to keep them from turning rubbery. Cooked eggs that are scrambled or used in a recipe freeze well. Boiled eggs don’t do as well because the whites get rubbery. Fried foods lose their crispness but do OK when reheated in the oven. Salty fatty items, such as bacon, sausage, ham, hot dogs, some lunch meats and some fish do not last long in the freezer. The USDA only recommends freezing these items for 1-2 months. The salt causes fat to go rancid in the freezer. Many people freeze these items longer so use your best judgment. If it looks or smells ‘off’ toss it. Cornstarch looses it's thickening power. Use a rue made of butter and flour (or rice flour if you're gluten free) instead. Gelatin weeps, or loses water. Vegetables such as lettuces, celery, radishes and cucumbers become a watery mess. Melons get very soft and lose much of their juice. They can still be used for smoothies but generally are not frozen. Meringue toppings become tough and rubbery. Custards and cream puddings can separate. Crumb toppings for things like casseroles or desserts can become soggy. Egg white based icing or frosting can become frothy or weep. Return from Foods That Can Freeze Well to the homepage of Favorite Freezer Foods.